I would urge caution with the flattening yield curve. The learning from the Yield Curve really comes post WWII, in a period after the Great Depression when the propensity to save was giving way to an avarice for consuming. This has wholly flipped. Consumers are saving, not spending, and private business is still not borrowing to invest. The propensity to save lowers yields and flattens the curve. While I expect a W-Shaped recession, a double-dip, I would urge you to look through the pithy one-liners learned during the Great Moderation. First, the Stimulus ain’t working. 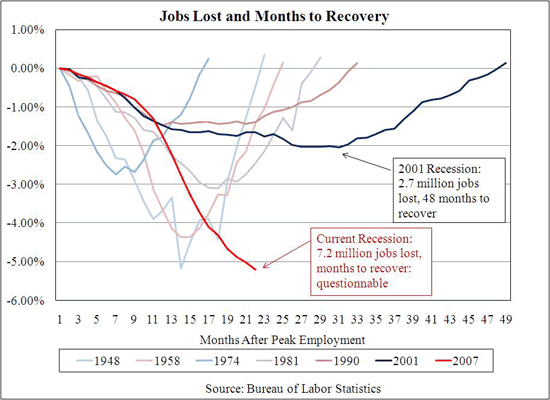 Disappointing employment news yesterday (see chart) and Mish thinks a revision of past periods is coming, indicating things are much worse than the government has been reporting. (I am shocked, shocked! they are dressing up the numbers.) Yesterday the Big Gaffer, Joe Biden, spilled the truth as he is wont to do: the administration will not try for a new Stimulus but will try to fix the one they have – implying that they too admit it is not working. Second, we are facing deflation not inflation. Yves’ wave count for bonds (see prior post) suggests a pretty serious drop in the long bond yield, which rather than indicating a flight to quality like last year indicates deflationary expectations. 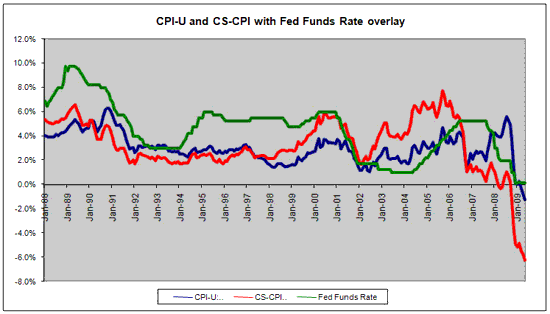 It is clear we have been in a deflationary period for over a year. Mish gave his take on Bill Gross’s switch to deflationary investing (more on this in Yves bond post) and also has been arguing that the CPI number is misleading since years ago the govt swapped out housing prices for an imputed rental. Well, oddly enough, as housing collapses rents can actual go up! Hence the whole housing debacle is misrepresented in the CPI. Here is a chart from Mish with the CPI recalculated based on housing not rental. Mish argues for deflation over inflation based on the real stats. Put this together: if deflation is worse than reported, the real yield on the long bond is quite high. if we actually have the -6% deflation of this revised chart, the long bond at 3.5% yield is at a horrific real rate of 9.5%. Time to buy! Deflation will drive that rate much lower to try to align real rates to a long-term 6% for the long bond. This supports Yves call to buy bonds, and PIMCO’s big move back into govt bonds (but not mortgage backed agency paper). Third, the economy may be worse than reported. 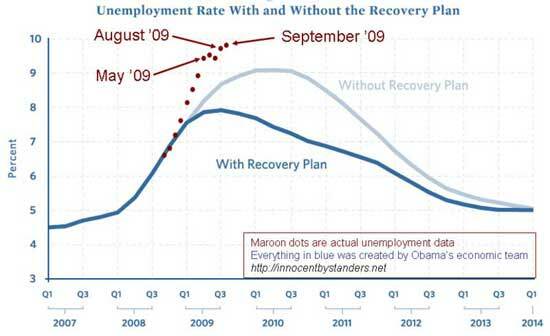 The Big Picture shows this depressing chart of unemployment compared with all other post Depression recessions. Trending out, it may not turn until 2011 and may not get back until 201. More comments on this by Karl Denniger, including an analysis that actual losses were closer to 1M jobs, not the reported 263K, due to people dropping out of the labor force (giving up looking for a job).